I do love trying “buffalo” food in all forms. Buffalo wing wraps, mac and cheese, pizza, nachos, poutine and of course wings right from the Anchor Bar in Buffalo, NY. So armed with package of chicken breasts in the fridge, I was looking for inspiration. My DD was requesting another dinner where we could have Baked Potatoes with a selection of toppings. I immediately thought of another bar menu item…potato skins. I found an inspiration recipe that contained both. When I think of Buffalo wings, carrot and celery sticks with a creamy blue cheese dip are always included and in my opinion you can’t do anything buffalo without some blue cheese! I added the celery and carrot components, next for the ‘potato skins’ aspect of cheeses, bacon and tomato garnish were added to the finished recipe. Served with a blue cheese and sour cream sauce it was delicious. And spicy like Buffalo should be! 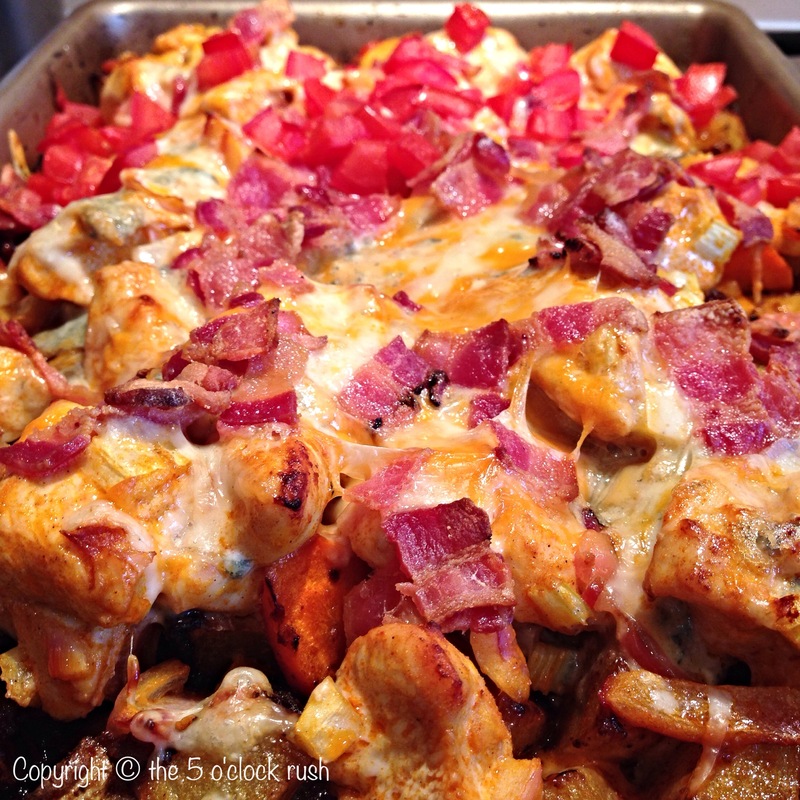 So if you love all the great flavor of Buffalo wing sauce and potato skins, here is a recipe for Buffalo Chicken and Loaded Potato Bake that contains both. Hope you will try the recipe and enjoy! Serves 4-6 approx. 45-50 min. In a large bowl mix together the olive oil, hot sauce, salt, pepper, garlic powder, paprika and agave syrup. Using a slotted spoon, scoop the potatoes into the baking dish, leave behind any extra olive oil/hot sauce mix. Add the diced chicken, red onions and celery to this hot sauce/spice mix and stir to coat all the chicken. Marinate the chicken as the potatoes bake. Roast the potatoes for 15 minutes at 500F, then stir and add the carrots, cooked for additional 8 min then reduce the oven to 400F. Stir the potatoes and carrots then add to the top, the marinated chicken, onions and celery. Cook for additional 5 minutes. In a large bowl mix all the topping ingredients together. Add the cheese topping to the chicken and potatoes. Bake 10-15 minutes or until the chicken is cooked through and the topping is melted and bubbly delicious. Add the tomato concasse and the Ready Cook Bacon pieces. 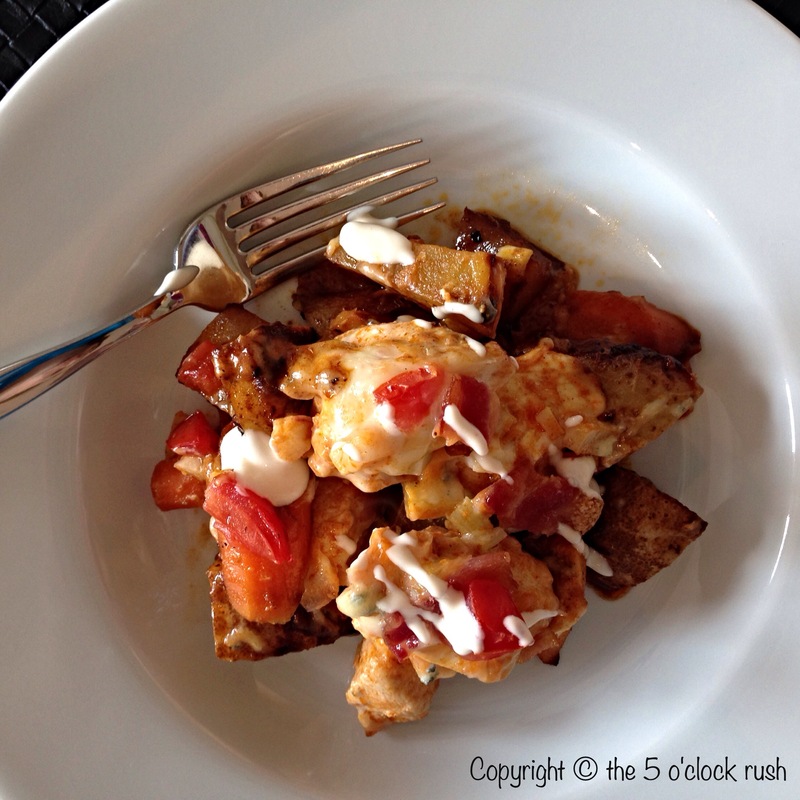 Mix the sauce ingredients together in a small bowl, drizzle over the Buffalo Chicken Bake and serve on the side. 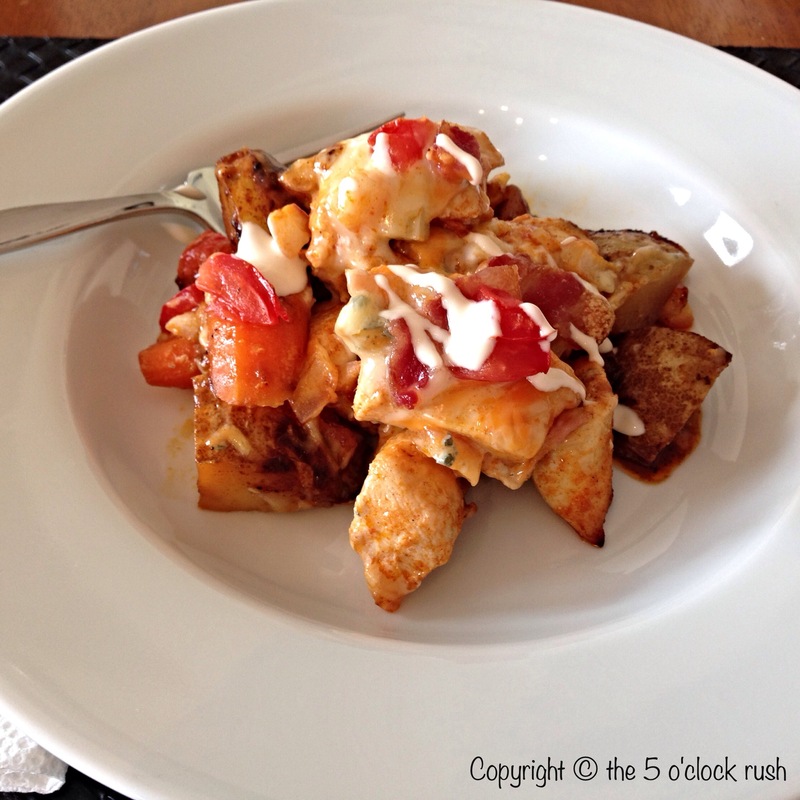 * The recipe could be adapted and the potatoes could be replaced with sweet potatoes. Scrub the outer skin of sweet potatoes, cubed and follow the directions above. Reduce the cooking time for the sweet potatoes. ** The Ready Cook Bacon is a convenience product that I always have in my pantry. I used scissors to quickly cut up the bacon strips. *** Concasse, from the French concasser, “to crush or grind”, is a cooking term meaning to rough chop any ingredient, usually vegetables. This term is particularly applied to tomatoes, where tomato concasse is a tomato that has been peeled, seeded (seeds and skins removed), and chopped to specified dimensions. I usually skip the peeled part but definitely remove the seeds as then tend to bitter. Wow Kim this delectable. Looks great!